Well, I was able to finish up my ceiling fan blades a couple of weekends ago! The whole project took almost no time at all, and I had the perfect window of opportunity with all the sunshine we'd been having. I suppose this could be considered kind of a "how-to" post, but really, it was so easy that I think anyone could figure it out. As a reminder, here are what the fans looked like before I painted them. They didn't really match, and they were very dated. I didn't want to put out the money to buy new ones though! I got to looking at them as I was cleaning them one day, and I realized that it would be so easy to just unscrew the blades and paint them! That way, I could kind of tie them together even if the bases still looked different. I originally decided to do the blades in black, because I thought it would really pop against the gold bases. 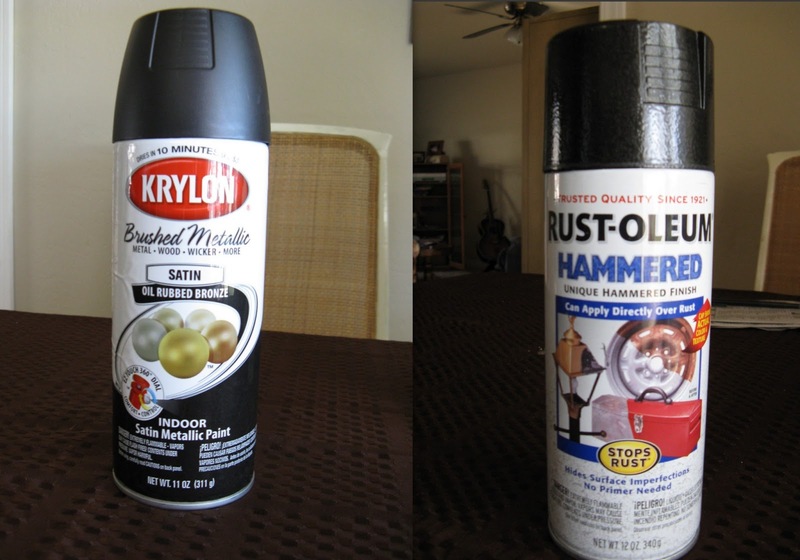 I had a couple of cans of spray paint, and I didn't want to have to buy any more (I know, what a cheapskate). So the color I ended up choosing was actually called Oil Rubbed Bronze by Krylon. The tops I did in Black Hammered by Rust-Oleum, so they would look a little different, and also have a shinier, slicker texture where the dust would gather. My theory is that it will be easier to clean this way? I guess we will see. As far as prep work goes, I didn't do much. Since I was using spray paint, I figured it would adhere pretty well, so I didn't sand them or anything. I'm pretty lazy, and when it comes to projects, I tend to have more of a "good enough" attitude. As long as it looks good, it's good enough, and if it needs fixing later, I'll deal with it then. All I did was clean the blades really well. I used a pretty heavy duty de-greaser and made sure there was no dust, or in the case of the dining room blades, grease. I washed and dried them, and then I was ready to go. Now I only got one picture of the actual painting process, but it's pretty self explanatory. Just follow the instructions on your spray paint can, and go to town! I had a couple of saw-horses to lay them on while I was painting, and that worked great, but any surface that you don't mind getting some paint on works just fine. Or lay down a lot of newspapers! After everything dried, all I had to do was screw them back into the base. This was the hardest part, so if you had someone to help with this, it would be better. That way, one person could hold the blade in place, while the other worked the screw gun or screw driver. 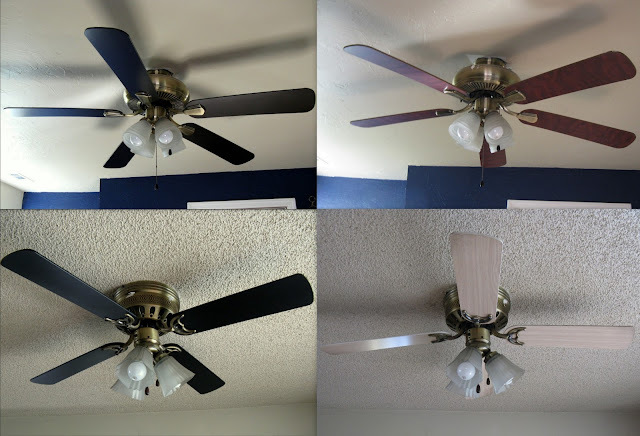 I actually had to use both tools, because of the different heights on the fans, but I was able to get most of it done by myself (Dane did do the family room fan one day though, when I wasn't feeling good). I suppose if a person wanted to update their fan even more, they could repaint everything, including the base, but this sounded like more work than I wanted to do. You would have to take the whole thing down. That's where you get into electrical stuff, and that's not for me. I liked this project because I could do it myself, and it took almost no time and money! Although, I did end up needing that second can of paint, because I started out with only half a can. Altogether, I used about a full can of paint, and I think I went a little heavier on the second set than the first. So, finally, here's the finished product! I love how they turned out, and I think they really work with the look of my house. I feel like black makes such an awesome accent/neutral color, and I use it a lot in my house. But you could do this in any color you wanted, and it would be a really easy project to do in a child's room, if they had a fan. You could use fun colors that matched the decor, and make it become a statement piece! If you're looking for a quick and easy update to your fixture, think about giving this a shot! This is my first post of the week, and that is so sad! Sorry I've been kind of m.i.a. this week, I'm still battling this cold! I've been pretty wiped out, and even though I've been reading lots of other people's blogs, I haven't felt up to doing any of my own. I have some things in the works, so hopefully it won't be too long before I'm back in action! Also, a quick little thing before I get to pinteresting. I found out yesterday that I won a giveaway! I never win anything, and this is the first giveaway I've won. Not that I enter that many, but I was seriously excited about this one. It was for a deluxe starter set of e.l.f. cosmetics! I love e.l.f. products, and their brushes are awesome! The giveaway was hosted by the awesome and hilarious Maddie of Thriftary, and it was featured by the adorable Abbey of Along Abbey Road! I'm still just so excited that I won, it has definitely been the highlight of my week! Thank you again ladies! Alright, so this week I thought I would be a little mean, and share some of the yummy stuff I've been pinning lately. I have the worst sweet tooth ever! Every time I see that saying "nothing tastes as good as skinny feels" I call bull. Because, I guarantee that all of these delicious treats taste way, way better. And this is why I can't lose weight! Ha! It hasn't been rainy all week like the forecast said, so I've been loving that! All I did last weekend was complain that it was going to rain, and we've actually had some sun almost every day. I got my ceiling fan project done, and I'm just being a little slow about posting it. I promise it's coming though, and I really love how it turned out! I checked out a couple of books from the library, and I read one last night! Granted, it wasn't very long, but it was really good. It's been a while since I've read anything other than a magazine article, or another blog. I decided this week that I am going to do my annual 5k run. It's every April, and last year I actually ran the 10 mile. I was so burnt out on the whole thing though, that I said I wouldn't be doing it this year. Well, I can't seem to find the motivation to work out anywhere else, so training starts next week! I decided this week to do my annual 5k run! Ha! Just kidding, sorta. I just hope that I don't totally burn out this year, because that's the reason I haven't really worked out in the last six months. Also, what kind of crazy person pays money to get up early in the morning, and go run in the cold? I guess I do. I am so tired today. I still can't seem to get my sleep schedule under control. I've gotten into the habit of staying up later and later, and then sleeping in. Or getting up early and being super draggy because I didn't get enough sleep! I feel like I've eaten only junk this week. It's not good. I'm hoping that my training will not only help to tone me up, but that it will be extra incentive to want to start eating healthier again. I'm ready to get back on the wagon, and look good for summer! Yay for more happies than crappies, and I hope you all have a great weekend! 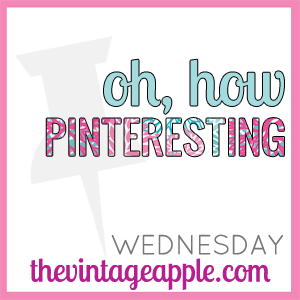 Here are some of the pins I'm loving this week! and I already own almost this exact same blue striped shirt! Now I know what I need to be on the look out for. This would look great hanging on my porch! I absolutely love this brick work, and the pops of color! 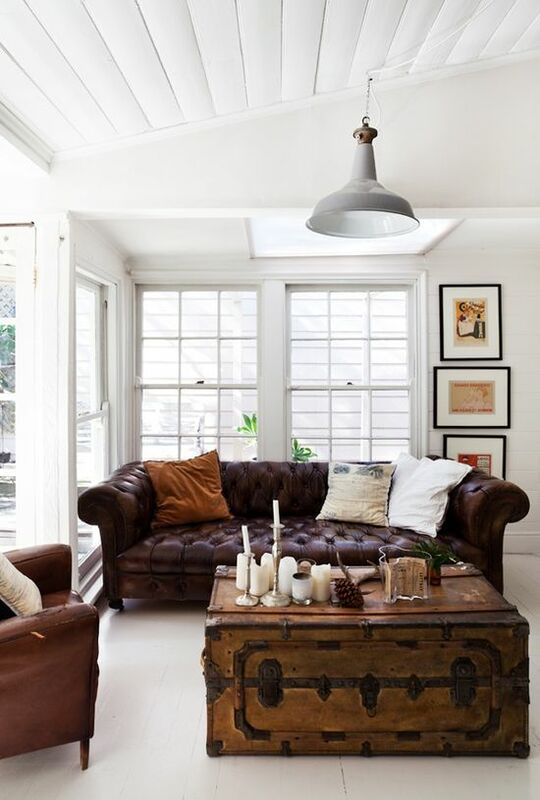 Love love dark brown leather couches! I am here to bring you the ultimate in time-wasting fun! Do you want to kill some of that extra time you find yourself with? Do you love to procrastinate? Or do you just want an overload of cuteness to brighten up your dreary Monday? Then you, my friend, have come to the right place! Yes, I know. You're welcome. If you are schnauzer fan, click here. If you are a basset hound fan, click here. Now go and soak in all that cuteness. This week had a very "sweet" holiday, Valentine's! I love this holiday, and our day went better than I could have thought! I tend to have a bad habit of putting too many expectations on fun occasions, especially when I'm planning awhile ahead. I always end up being let down. This wasn't the case this year though. I think I'm getting better at managing my expectations, and our day was so fun and romantic. It's definitely close to the top of the list of our better Valentine's experiences! I got to work three times this week (actually at this moment, it's been two, but by the time you read this I'll probably be working my third shift). I love how much I have been welcomed in my new workplace, and the only thing I hope is that I don't catch this flu bug going around. I haven't caught it yet, so knock on wood! Last Friday night, after that day's H&C's had been posted, we went bowling with some friends. I had been after Dane to take me all winter, so that was super fun! I am totally terrible at it, but it's such a good time anyways. I could bowl every weekend and not get bored, I'm sure! Ok, well maybe I'm not totally sure, but I could definitely go more than once every couple of years, this I know! I actually did some yoga this week. I felt so good after I did it, but during was really hard. I knew I had let myself get out of shape, but I hadn't realized just how much. My legs were shaking so bad trying to hold some of the poses, and I was definitely not where I used to be. To put this in perspective for you, a year ago I was running eight+ miles a week, training for the ten mile run I did in April. Yeah, I really let myself go. but kudos to me for actually doing something about it this week! It has been super sunny, and hitting the low sixties all week long. I can't even describe how awesome that has been. I even opened up some windows to air out my house today, for the first time in months! It's so great! I actually didn't really have much for crappies this week. The one thing I can think of, some sad news I received, is not something I feel like discussing here. So I'll just be glad that my week was mostly good, and hopefully that will continue! Have a great weekend everybody, and thanks for stopping by! Happy Valentine's Day everybody! I have been totally slacking in the whole "drafting posts ahead of time" thing, so today's post is going to be a little less in depth than I had originally planned. I thought maybe I would use today as an excuse to tell about my husband and mine's love story! It will have to wait for another day though, because in true Amy fashion, I have a huge list of things to do today, and I didn't give myself enough time. So instead, I'll just fill you in on our v-day plans! I love Valentine's Day. I know it's not the funnest day for some people, especially if you're single. I've definitely been there. And I try to always let my husband know how much I love him, everyday. I love to surprise him with little treats all the time! But, I'll take any extra excuse to be romantic and sweet with my honey, and since there's a holiday for that, I'm all on board! This morning I made heart shaped pancakes for the first time, but what made it special was the fact that I made breakfast on a weekday. Trust me, that's a big deal, and very much appreciated by Dane. I also kidnapped him from work for lunch at one of our favorite cafes. It was really nice, and I think he enjoyed the break from the stresses of work. I know I did! For the big night, we usually don't do a big huge thing. There's no gifts, no jewelry, no chocolates, or flowers (actually, a couple of times, there have been flowers). The most commercial thing we do is buy cards, and that doesn't even happen every year, because sometimes I get my lazy self in gear and make him one! Tonight I just plan on making a nice dinner, like I usually do. I'll light some candles, and we'll probably watch a movie. I want to spend some time playing board games, because it's been a while since we have, and we're nerds like that! Also, I'm super excited about the dessert we're having! There's a very pretty, little wine and tapas bar here in town that serves the best flour-less, chocolate cake ever! I'll be stopping by there this afternoon to pick up a slice for us to share. That is what our Valentine's day looks like, and I've been having a great day. Before I go, here's a bit of craftiness. I made my sisters some holiday themed bookmarks, which they will be receiving late (of course). I also made Dane a card this year. I'm pretty happy with how they all turned out! What are all of your plans for this lovey-dovey day? Did you make anything crafty? Let me know, and I hope you all have a great day! I was recently tagged in a post by my friend Molly over at Mae Live Free, to be a part of the Liebster Blog Award! Now, there really isn't any award, but it is a fun game to play with your fellow bloggers, and show some link-love! Write eleven facts about yourself. Answer the eleven questions given you by your tagger. Create eleven new questions for those you tag. Tag eleven bloggers, with less than 200 followers, and let them know they've been invited! See we're having fun already! I'm just starting to get a little more into photography, hence the picture at the top that doesn't seem to really belong. I just thought it was pretty! I don't really know if this is a hobby that will go anywhere, but I'm enjoying just playing around with it. I am such a total nerd. Like, nobody really has any idea how totally uncool and awkward I can be. Except for my husband Dane, my best friend Kayla, and my family. They've seen it all! Every weird noise, accent, funny face, you name it. I'm surprised I don't embarrass them all in public more often! I love orange! My favorite color has bounced around a lot over the years, I used to be super into green. Now, I don't really love it. But I would love to put loud, punchy shots of orange all over the place. I feel like I am a really confident person by nature, but I am also really insecure. I feel like my insecurities aren't who I really am though, if that makes any sense? Like, deep down, I like myself a lot, but life gets in the way, and there's always something to make you feel not good enough. I would love to move past those insecurities someday, and become that confident person I know I am! I have a completely unhealthy relationship with food. Mostly sugar. But it is just so good. In fact, speaking of sugar, I want some cake. Or cookies. Ooh, or some brownies! Anyways... where was I? I love my job! Currently I only hold a substitute position, but I get to work at an elementary school as an aide, and it's fantastic! I get to work with a lot of wonderful ladies, and some really great kids. I completely over use exclamation points! Way too much! I don't know why I can't seem to stop using them! They are probably really annoying to everyone else! Actually, maybe no one else ever noticed, but you will now! I have five little sisters, how crazy is that? Those goofy little girls are so great, I miss them all like crazy! It seems like I'm always seeing kids that remind me of them. I guess that's when I know I'm getting really home sick. I love music so, so much. I have always loved it! As a kid I entertained notions of being a professional singer or musician, but I definitely don't have that much talent. I love to sing still, and if I don't have music playing all the time then I feel off. I love songs that move me, and right now my favorite genre is folk rock, or folk pop. Think the Lumineers and Mumford & Sons. I am a terribly lazy person. I spend way too much of my free time (and then some) sitting on my computer, not doing much at all. Reading blogs, which is great, facebooking, checking email, reading random articles. You name it, I'm probaly wasting time doing it. It's one of those things I feel like I really need to work on. 1. If you could have coffee with ANYONE, who would it be and why? This one is tough. I think it would be my mom. After four and a half years of living in another state, and knowing that I probably always will, I would love to be able to have coffee with her whenever I wanted! I'm sure that's not what this question was about, but that's my answer. 2. Tell me about one defining moment in your life? I feel like I have a lot of these moments, and it's hard to pick just one! I guess I will go with one of the happier ones. I was talking to my best friend on the phone from where I was on vacation. I had just started dating my husband, and I was telling her how head over heels I was! I told her that I was pretty sure I was in love, and that was when I actually realized it. I was completely in love! Of course, she gave me the usual response, and told me it wasn't love, it was just hormones. That feeling never changed though, and I think that was when I really started to realize that he was going to be my forever. I love to write. I have thought and thought about writing, anything really, but I never could seem to do it. After discovering and following so many amazing blogs, I began to think that this was the perfect outlet for me to use. I'm not sure where, if anywhere, I want this all to go, but I love the practice that it's giving me, and I hope to get better! I also like crafty stuff, I'm just not very motivated, so I thought this would give me the kick I needed to get some of my projects done! 4. If you could only listen to one artist/band for the rest of your life, who would it be? This would be really hard, even though I'm the kind of person who can listen to something over and over again before I ever get tired of it! I guess I would have to say Mumford & Sons, they are at least tied for, if not hold, the spot of my number one favorite! I love Mexican food! I could eat it constantly. And I don't mean real authentic Mexican, although I'm sure I would like that too, but good ol' greasy American Mexican food! I think guacamole is the best invention ever, and a big, deep fried chimichanga covered in it really hits the spot! 6. If you had to come up with a unique tradition for you/your family, what would it be? I have actually had to do this since I moved away from my family. There are a few holiday get-togethers that I have to miss out on now, that my husband's family doesn't always celebrate. So far nothing we do has really stuck, except for going to the coast on the fourth of July, and even that we haven't done every year. I would love to have a new New Year's Day tradition though. Probably brunch, since I love brunch, and just having some of our friends and family over. Not really unique, but it's not something we've never done either! 7. Tell me something that makes you unique? I am, what my husband likes to call, a person of extremes. This goes for most things in my life. I can be the biggest, grossest slob you've ever seen, but when I want something clean, I'm going to clean it totally. Like OCD clean and organized. I'm the same way with my diet. When I'm on one, I'm on it. Nothing bad for me! But as soon as I fall off the wagon, I pretty much dive right into a pile of donuts! Then I will eat junk food like it's going out of style! It pretty much drives everyone around me crazy. 8. What poem or quote would you say applies most to your life? I love the saying "This too shall pass." My mother-in-law said it to me when I was going through something difficult in my life, and I like to think about how true it is. No matter what you are struggling with, it's so comforting to know that it will pass. It might take a long time, or it might be quick. But someday you will wake up and realize that this thing you've been fighting is finally over. 9. If you were a coffee shop drink, would you be a? 10. What is your most treasured possession or memory? One I've been thinking of lately is from a little over a year ago. It was the weekend before my brother's birthday and he was here in town. We decided to take him out to a pizza place that we love as a treat, and a couple of our friends came along too. With everything that happened soon after, and with all the regrets I've had, it took a while before I remembered even having that night with him. I'm so, so happy that I did, and I love to think about it and the fun we had. I know I'm going to cherish that memory for the rest of my life. 11. You find a $100 bill on the sidewalk, what do you do? Do a little squeal and dance in my head! It must be my lucky day! Seriously, I would love to find an extra $100, but I would probably blow it on a fun date night, and maybe a new outfit. If Dane had anything to say about it though, it would probably go into savings. So honestly, I guess we would probably split it 50/50. Half in savings, half to have fun with! What is your biggest inspiration when it comes to blogging? If your life were a movie, who would play you? What is your favorite scent?. What is your favorite hobby, besides blogging? What is your go-to, favorite outfit? If you could learn another language in a day, what would it be and why? Who is the biggest hero in your life? What is your biggest goal, in regards to your blog? So there you have it! I'm tagging all of these lovely ladies below. If any of you decide to join in, don't feel obligated to ramble on as much as I have! You can write as little, or as much as you like! Reading Still no books! I have been reading a lot of blogs though, there are just so many good ones out there! Writing A lot less this week. There is one post I've been working on for a while, but it's still not quite done. I need to start drafting more up though, because I definitely feel a difference in how motivated I am when I'm writing a lot, or when I'm not writing much at all. Listening I was listening to Dane playing the guitar (he's pretty great! ), but now I only hear my dishwasher. I guess he must have found something else to do. Thinking About all the projects I want to get done. I might even start some today. It seems like a good day for being productive! Smelling Pancakes. I made them the last two mornings because we had strawberries to put on them! I have decided that is one of my favorite ways to eat them, it seems healthier and more fresh that way, for some reason. Wishing We had our taxes back already! I would love to take a trip to Idaho to see all of my family, but I probably won't be able to until we get those back. We're getting there though, hopefully we can get them filed this week, and get our returns in time for me to go for spring break. Hoping The weather stays as nice as it has for a while! It really perks me up when it's not all dreary outside. Wearing Pajamas still. Even though it's after noon. That's what happens when you sleep in late! I've never been one for getting up and around quickly in the morning, and especially not on weekends! Loving I'll say it again, all this sunshine! It has warmed up quite a bit lately, and the last two days we've woken up to clear skies. February is always really nice around here, for some reason. It makes for a nice break up of the rainy months. 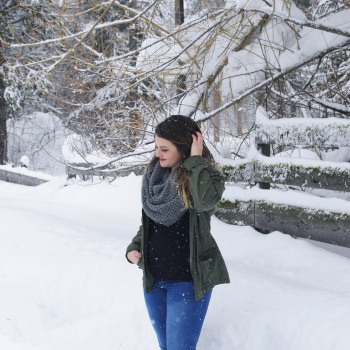 When it rains in the fall, and in the winter, and in the spring, it's great to get a chunk of time where we can shake off those rainy day blahs! Wanting To go outside today. I think maybe disc golfing (if you don't know it, look it up, it's awesome!) and playing with my little mutt are on the agenda. Needing To catch up on my dishes. We're on one load of at least two that need to get done today! Feeling Really great today! We had a fun weekend, and got to hang out with a lot of our friends. I love weekends like that, but I also love just spending time with Dane, and that will probably be our plan for today. Clicking On youtube, watching the Kid Snippets and Kid History videos! You should click here, this one is my favorite. They are so, so funny! I spent this foggy Friday morning in the best way possible. Curled up under cozy blankets, drinking my Dutch Bros, and watching Netflix. All the while letting my hair soak up some olive oil! Such a nice and relaxing way to start my day, especially since it started at 5:20 this morning! I hate it when that happens! This weekend is going to be semi-eventful. We have a wedding to go to tomorrow evening, and that is our major plan for the weekend. It's about an hour away, and we still haven't decided if we're staying the night. I'm excited though, but mostly because it gives me an excuse to dress up! This means that I have to go buy a wedding gift this afternoon, so I will be doing that and running some errands (bleh, bills!). Hopefully I will have some projects to share after this weekend too! Wish me luck. I hope you all have a great weekend! Do you have any fun plans? Let me know! I got to go to work this week, even if it was only for one day. It was great as usual, and I really don't want this to come out as conceited, but they like me a lot down there! It's just nice to know that I'm appreciated for the work I do, and to know that they enjoy having me around as much as I enjoy being there. I love that I've been working there long enough now, that a lot of the kids know and recognize me! We had some of our friends over for the Superbowl, which was a lot of fun. There was a lot of good food, and we all had a good time. I just wish I had taken some pictures! We've had a couple of days of sunshine, with temperatures in the high fifties! It was so, so nice! I don't realize how much I miss that sometimes until it actually happens. It's been a good mail week for me so far. I got some t-shirts from JC Penny, that were only $6 a piece, and today I got my swim suit that I ordered off ebay. It's a bikini, so no one besides hubs will probably ever see me in it, but I scored a great deal, and it was only $7! That includes my shipping! I watched a very touching documentary, recommended by Maddie, called Monica & David. It's about a couple with Down's Syndrome, and it follow them during some of their first year of marriage. I love how it proves that love is such a powerful feeling, and even those with disabilities are more than capable of feeling and expressing it. They were so cute, and normal, in the ways they showed their love for one another. It was very good, and it's available to stream on Netflix, so if you have a chance you should watch it for sure! I have been mowing down on leftover Superbowl cookies all week long! Not only has that made me feel totally sluggish and gross, but I'm getting terrible heartburn. Hopefully now that they are gone, I can start eating a little cleaner. I can tell that I definitely need it. Speaking of food, I have been feeling totally uninspired in the kitchen lately. I can't seem to come up with good healthy recipes, and the few times I do, I run out of the motivation to actually make something. We've ate a lot of processed food this week (rice-a-roni, frozen pizzas) and I want to come up with some new things that will be quick and easy to make, while still being healthy. I will probably need to come up with a new set of grocery staples, and I think that's probably been the biggest thing holding me back. I still haven't started on any of the Valentine themed projects I wanted to do before next week! Hopefully I will get some done this weekend, since nothing I plan on doing is going to be very difficult. Mostly I just wanted to do up some home made cards, so I need to get them going soon! Alright, so there's my week, now go link up with Sarah and Stephanie!